PLEASE NOTE: Regal Palms charges a $12.95 resort fee per townhome (not per person) per day plus tax which is not included in our nightly rates below. This fee is not included in the quote. Guests will pay this upon check in at Regal Palms. Regal Palms Resort - Disney area, Florida is an upscale gated community located just 7 miles from Walt Disney World. This luxury resort sits nestled just off Hwy 192 and US 27 and is one of the most desired resorts in the Orlando area. During your stay you will enjoy this well appointed home that has been designed and decorated to provide you and your family an abundance of luxury amenities and leaves you well equipped to vacation with all the usual items you would expect to find at home. Regal Palms Resort is only a 30 minute drive from the Orlando International Airport, and is situated central to all if Orlando’s famous attractions. The resorts amenities include gated community, huge resort size swimming pool, Jacuzzi, water park, waterslides, lazy river, volleyball, clubhouse, restaurant,and a fitness center with a full treatment spa. This spacious 4 bedroom holiday villa is just a 8-10 minute walk from the resort amenities. This villa can comfortably accommodate a family or group of up to 8 people. Come stay in this wonderfully designed resort where you’ll enjoy luxury living at its finest. Whether you want to escape for peace and quiet, or would rather explore for a bit of adventure, Regal Palms can fulfill all of your desires. 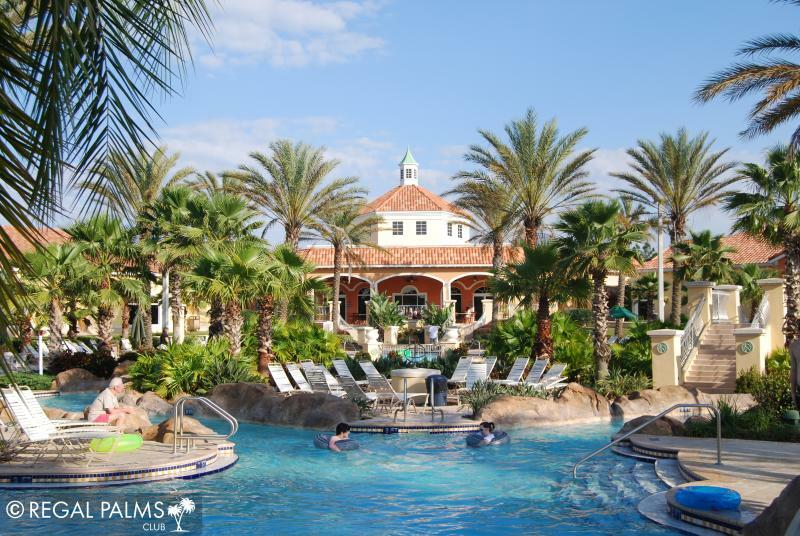 Regal Palms Resort was developed with the discerning vacationer in mind offering security with gated entrance, privacy, and peace all just minutes away from Orlando’s famed attractions. Regal Palms Resort was developed to ensure that it was close enough to see all that Orlando has to offer as well as to make certain that there was plenty to do right within its gates. The Resort caters to groups, both family and business oriented, and continues to be one of the best and most sought after accommodations in the Orlando, Florida area. Regal Palms Resort & Spa welcomes Banana Jacks to it's wide variety of popular amenities! Explore and be a part of the adventure at Banana Jack's, the ultimate themed dining, resort arcade experirence, sure to be a favorite fun spot for families! Take a break from the pool and jump straight into a Pirate-themed kid's fun zone at Banana Jack's featuring games, prizes, food and entertainment for the entire family. Boasting a 4,000 square feet state of the art resort arcade room, featuring an indoor playground offering an interactive experience all connected by bridges, tunnels, crawls and decks as well as a full restaurant menu to satisfy your hunger. Banana jacks is one more reason why Regal Palms Resort & Spa is the premier family resort in Orlando. convenient to Disney which was the purpose of our trip. Older home but clean and well taken care of. No TV in the downstairs bedroom. Would rent again. What a fabulous vacation spot! Not only was the condo clean, spacious and well appointed, but the resort was as well. The staff was pleasant and helpful. Very accommodating. The pool was phenomenal and we really appreciated the ability to use multiple pool toys! So many pools don't allow those things. Great experience that I would not hesitate to repeat! Owner's reply: Thank you so much for your kind comments. I'm so glad you enjoyed your stay and hope to hear from you again! Estimated price per night based on a weekly stay. Owner fees of $179.00 per stay may apply. Enter your dates to see the total cost.